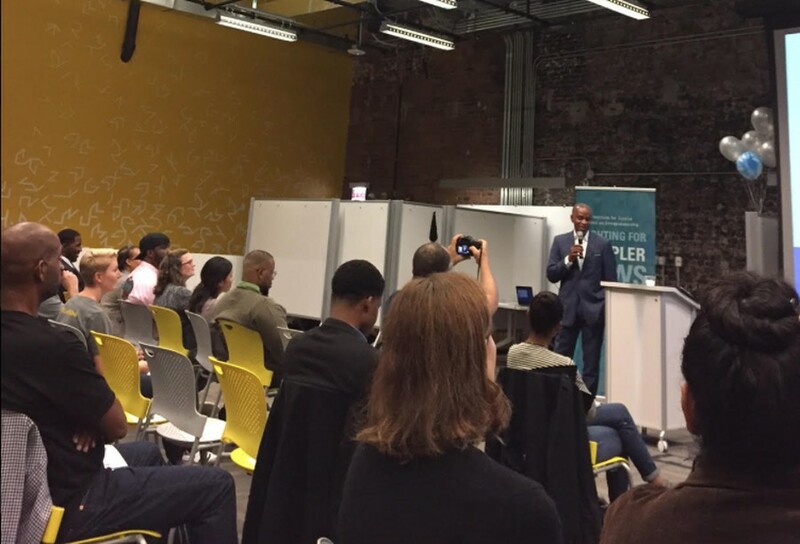 The “South Side Pitch” competition was hosted at the Polsky Center on Thursday. A free Yelp-style smartphone app for user-submitted reviews of Chicago police officers won first place on Thursday in a Polsky Center entrepreneurship competition. The “South Side Pitch” competition was hosted by the Institute for Justice Clinic on Entrepreneurship. Finalists this year ranged in background from college students to former soldiers in Afghanistan. The CEO of the winning app, Excuse Me Officer, said he was inspired by a friend’s near-fatal encounter with a Chicago police officer. The app allows users to submit both positive and critical feedback about their interactions with specific police officers. The first-place prize includes $4,000 in cash, advertising in Crain’s Chicago Business, free conference space rental and a one-year membership to the Polsky Center. While over 17,000 people in Chicago have already downloaded the app, Harris said he would like to introduce it into five other U.S. cities within the year. Excuse Me Officer was among six finalists that were selected from an original pool of over 150 applicants. A two-round elimination process, including a 30-second video pitch round, began in mid-August. In the final round of the competition on Thursday, competitors presented three-minute-long pitches to a panel of three judges. The second-place winner, which received $2,000, was Oooh Wee Sweet Tea, a company that makes flavors of sweet tea with names like “Obama” and “Beyoncé” using raw honey sourced from about 20 beehives in Chicago. The third-place winner was another food-related business, Justice of the Pies, which plans to employ non-violent criminal offenders from the South Side. Winning third place, which includes a cash prize of $1,000, will allow Justice of the Pies founder Maya-Camille Broussard to expand her business to Whole Foods Markets in the Chicagoland area, she said. The keynote speaker and founder of Green Delta Ventures, Galen Williams, shared an anecdote about the impact of a similar fast-pitch competition on his entrepreneurial endeavors. As a University of Chicago graduate student, he co-founded the first indoor produce farm in Chicago and won first place in a San Francisco pitch contest.